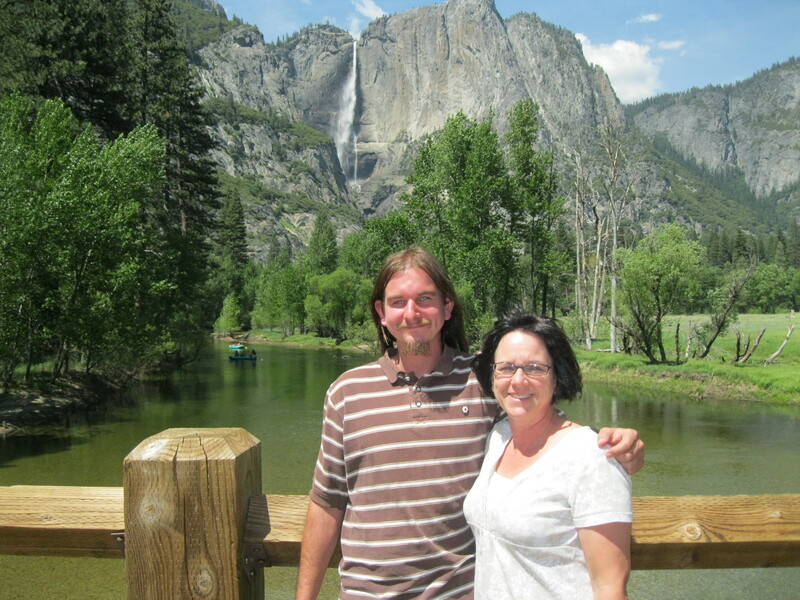 Last week, Andrew and I walked the Valley Floor Loop in Yosemite National Park. Today Michael (my middle son) and I walked the Sentinel and Cook’s Meadow Loop, yet we did not cover any of the ground that Andrew and I did last week. Swinging Bridge with Yosemite Falls in the background. It was a warm, sunny afternoon. We started the walk at the Swinging Bridge picnic area. At the bridge, we watched children play in the cold water below. Half a century ago, this used to be a real swinging bridge. 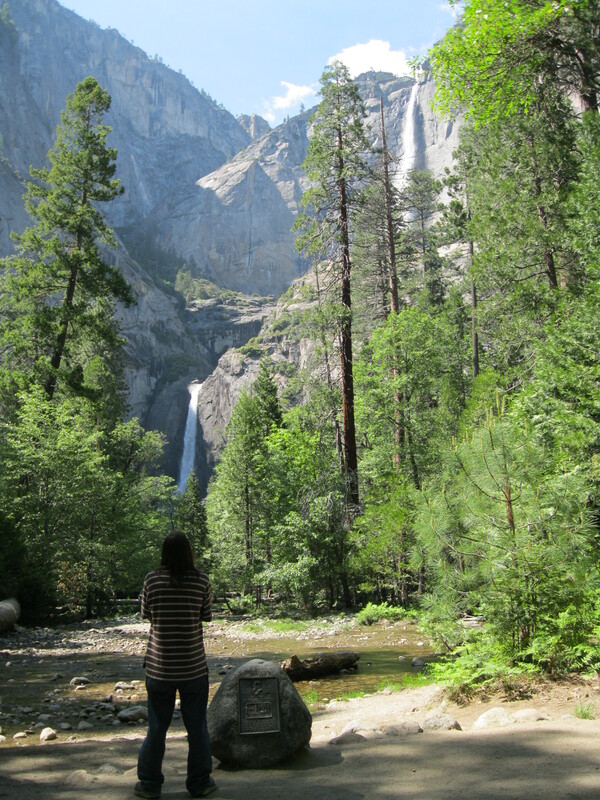 The highlight of this walk is that you can see Yosemite Falls from all over the trail. This path leads to Yosemite Lodge. We made our way to Northside Drive and headed to Lower Yosemite Falls. Yosemite Falls is a 2,425 foot, three-tiered cascade. It is the tallest waterfall in North America and the fifth tallest in the world. The shortest section, lower fall, is 320 feet. We stopped at the viewing area, along with many other people and watched the falling water. The water created a misty breeze as it fell. 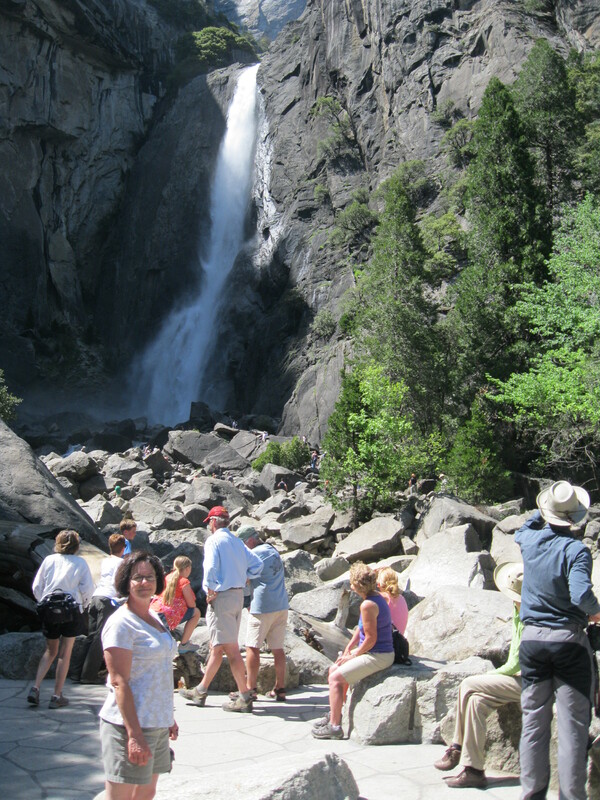 There were lots of people on the Lower Yosemite Falls trail. Walking away from the thundering falls, we strolled through the woods and took a side path that led to a spot in the shade where John Muir once had a cabin. 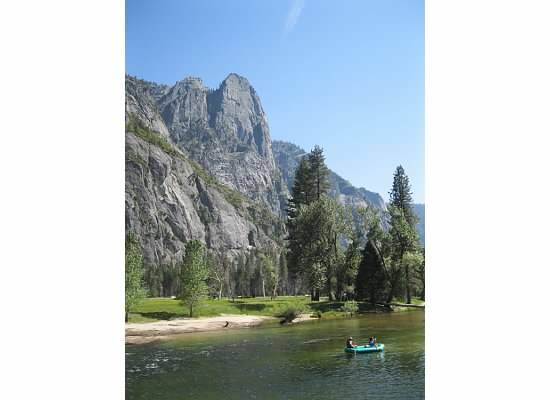 At this spot is a spectacular view of the whole Yosemite Falls. The rock is a marker for John Muir’s cabin site. Continuing on we walked through Cook’s Meadow. 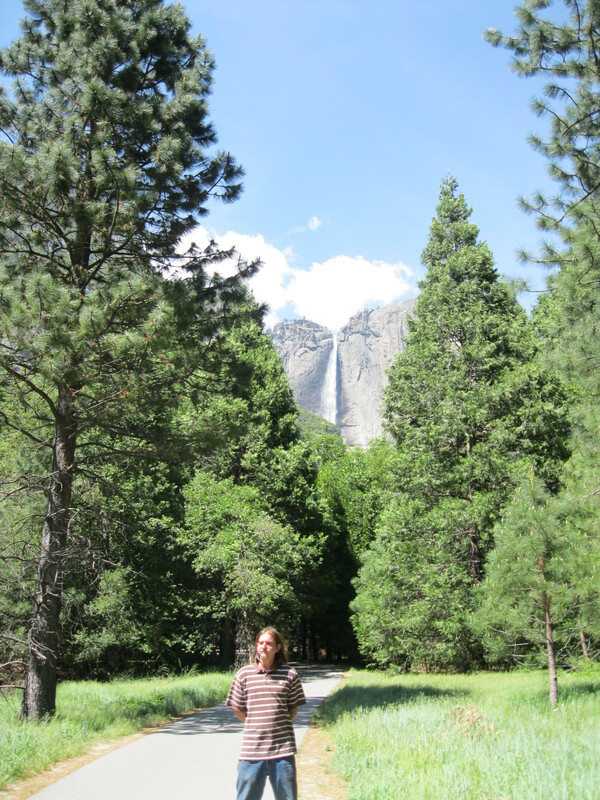 The sights from the meadow were great: Yosemite Falls, Half Dome, North Dome, Sentinel Rock and Glacier Point. In Cook’s Meadow there is an apple tree that was planted by Yosemite pioneers. Below the bridge we watched as rafters made their way down the lazy Merced River. There are many boardwalk trails throughout the meadow. Drifting down the Merced River. 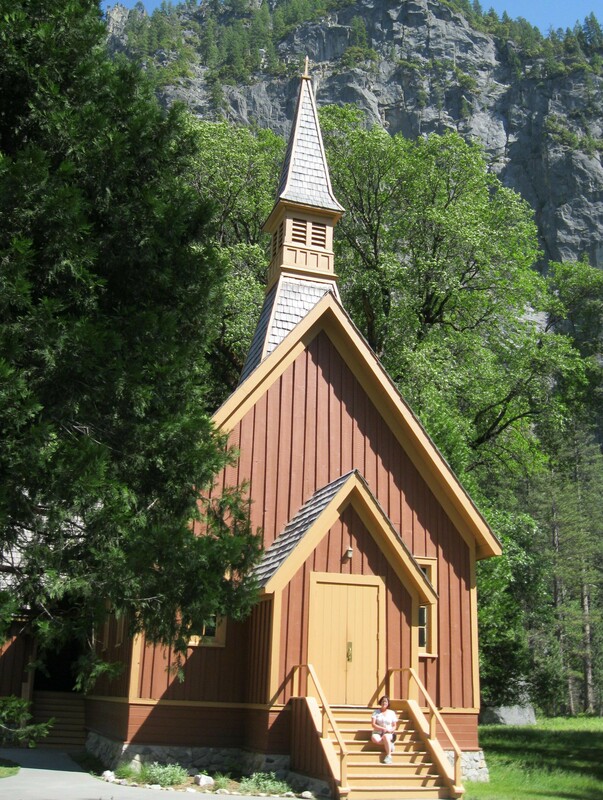 A short jaunt led us to the Yosemite Chapel, built in 1879. It is the oldest building in Yosemite Valley and is still in use today. Leaving the chapel we walked the short distance back to the car. 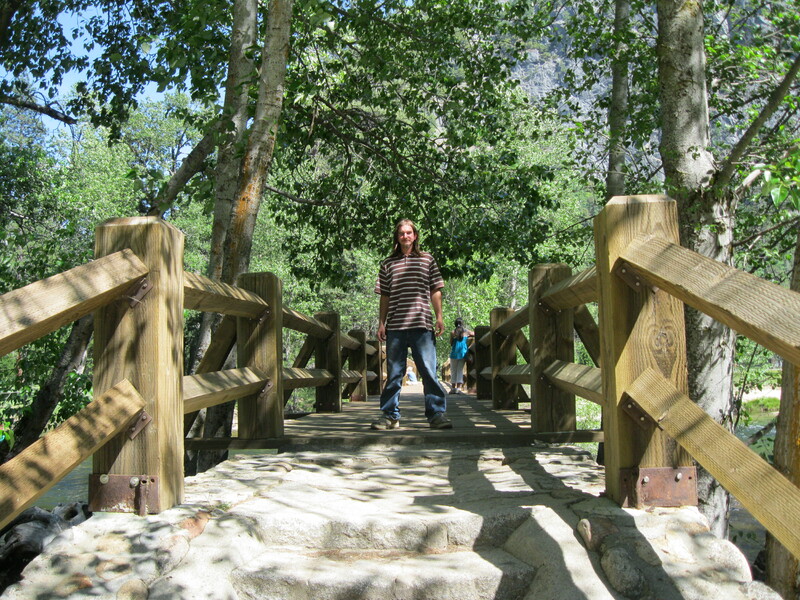 This entry was posted in Yosemite Hikes and tagged Cook's Meadow, Merced River, Sentinel Meadow, Swinging Bridge, Valley Floor Loop, Yosemite, Yosemite Chapel, Yosemite Falls on June 2, 2012 by Janet.